In his famous TED Talk, Sir Ken Robinson indicted the current school system with the provocative title, “Do Schools Kill Creativity?” In a very entertaining manner, he outlined the failings of the current system -- especially in terms of the creative arts. His thesis was that the current system was set up to service the industrial age and just will not be sufficient for the information age. He offered no practical solution for how to effect this change in a scalable manner. The current educational system is deeply ingrained in the premise that there are two scarce resources which must be optimized. These are the instructor (the knowledge bearer) and the classroom (the place where knowledge is imparted.) The vast majority of educational institutions are based on this structure. 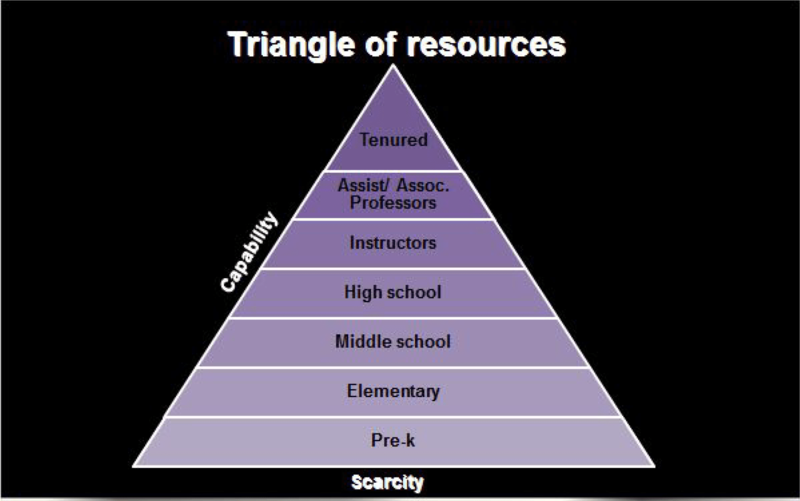 Further, as one proceeds up the academic ladder, scarcity rises. Chart 1 shows the model, and one must make the point that for hundreds of years ...THIS SCARCITY WAS REALITY! The industrial response to this scarcity was to build a system with the teacher/classroom at the center and a series of processes to optimize cost, learning and utilization while students (the widgets in this model) are marched through an assembly-line process by the teacher/classroom. In this model, learning occurs via osmosis and is highly correlated with the effectiveness of the teacher/student engagement. This has led to a structure of the teacher as “craftsmen.” Chart 2 illustrates some aspects of this model. To be fair, this model has been a massive success in elevating the general education level of millions (if not billions) of people. Having said this, the system is highly bureaucratic and unlike all other craftsmen-centered sectors of the economy, there has been very little professional automation within teaching. Finally, and most importantly, the negative consequences of this system for the student are significant. Given that the fundamental model is one based on craftsmen, the infrastructure support provided to teachers is very limited. Thus, teachers are forced to create large parts of instruction Intellectual Property (IP) and once they get something working, they are very reluctant to change. Other industries -- ranging from retail, services to product development -- have moved away from the “craftsman” model to focus on consistent high-quality processes based on the development and deployment of IP. Today, across the world, teachers build and deliver lessons on a massive scale. At the point when the lesson is delivered, it is lost. That is, it is not captured in any mechanical way. This means that students do not have access to the content other than at exact the time it was uttered. This also means that this IP cannot be reused -- and most importantly -- cannot be improved over time. The only real IP capture and reuse mechanism is the textbook and in limited cases, the recording of a lecturer delivering a lesson. Further, specialization and separation of tasks is the cornerstone of a capitalist system for raising productivity and quality. However, these concepts have not injected themselves in the area of instruction IP. If instruction IP was a product, copywriters, editors and graphic artists would be involved. With today's technology underpinning, there is a ready ability to build engaging content with built-in assessment, but for the most part, this is not the focus of the current education complex. Beyond conventional textbooks, there is a need to build marketplaces which allow for the exchange of instructional IP and further allow for contributions/collaborations to improve this IP over time. All the technologies to enable this process to exist today, and in fact, have been used extensively in the field of open-source software. There is enormous inefficiency currently in the system which can be used more productively with a coherent IP strategy for instructional materials. Finally, it should be pointed out, the vast majority of classes taught in high school and early college are “commodity.” Thus, there is really no need for hundreds to thousands of variations based on instructor personalization. The personalization should very much be driven by student learning styles and not teacher's delivery styles. Because of the craftsmen model for teaching, each teacher builds their own engagement strategy. The net effect for students and parents is the management of the varying styles of teachers. In fact, we would not tolerate this from any large institution. (Imagine that your basic banking processes were different based on the teller with whom you engaged.) We know of students who have to manage 17 unique accounts for one semester's worth of work in a high school environment. In fact, technology has made this worse. Teachers use technology in a varying manner and often use different applications. The result: Immense complexity for the students in remembering and managing the wide variety of applications. There is a real need to standardize the engagement model for the student and parents. It is not clear why districts, states and even the federal government do not focus on some level of standardization of these tasks. All three of the above are the impact of the “craftsmen” model for teaching. They create enormous costs/wasted resources in the system for no particular benefit. A simple evolutionary process would be to employ technology wisely to remove from the system so that teaching effectiveness can be improved. Relative to the student, the current model has its costs and consequences well beyond the evolutionary issues mentioned above. These include flexibility, differentiation and a fairly contrived use of assessment in the current grading systems. Students who can move at a faster pace are underutilized/generally bored. Students who need more time to absorb the concepts are penalized in a recurring fashion in a race to catch up or fail. Imprisoned in Time/Space: Students who function badly in early mornings (medically documented for teenagers) or mid-afternoons are forced (in fact they are imprisoned in K-12 education), to endure the lectures at times of low attentiveness. Scheduling and program management skills are over-emphasized. In fact, schools (typically unknowingly) transfer the complexity of load management to the student/parent. Since the objective of the whole educational system is to promote learning, the only good which comes from this lack of flexibility is to build an economically viable delivery system. As we mentioned, this is entirely justifiable as long as the core tenets of scarcity are in fact, true but there are significant costs for the student/society. Read any luminary in the area of career development (e.g. Reed Hoffman, the founder of LinkedIn), and you will find that they will focus on the point that everyone needs to build differentiation (a personal brand) in an area which can be economically valuable to society. Without explicitly intending to do so, the current K-12 educational system actively discourages building differentiation. The classes and curriculum are largely banked based on the realities of the delivery system. Interesting classes outside the realm of the conventional cannot be considered given the commitments to the teachers and limitations of bringing the teachers into the classroom. The limitations driven by physical proximity and the cost of delivery force the offering of only classes which have mass appeal. All of this creates the comic situation where students are pushed through a largely uniform K-12 education system only to be asked near completion by colleges ... “So how are you different?” A good subject for a The Far Side cartoon. In terms of building something which is economically viable, the current K-12 system explicitly makes this task almost impossible. Students are physically imprisoned (they cannot leave) and segregated from society. Near the end of their K-12 term, they are asked ... "So, what do you want to do with your life?" At its core, it is nonsensical because of the circumstances, yet this is the current structure of the educational system. As historians say, it is not fair to judge the historical figures of the past based on today’s norms and so the current educational system can really only be judged on the problems it was solving at the time. However, with that caveat, solving the problems of differentiation and career discovery earlier would have enormous positive consequences for students as well as for society. Finally, assessment is a key part of learning, especially when provided close to the learning process. Also, certification of competence is also an important concept. However, the current grading/transcript paradigm was actually developed for an entirely different purpose -- filtering. Since scarcity rises with educational capability, the current grading systems are built to provide mechanisms for filtering among students. This is why they often reward speed of learning or measure irrelevant intermediate assessment points as opposed to the competence achieved at the end of the class. Given the current view on scarcity, this is perfectly reasonable. However, it does lead to some nonsensical situations. In the current situation, parents pay taxes (or tuition) to schools to teach their children and if the student/teacher do not succeed in reaching the required capability, the student is given a “bad grade.” The only purpose of this bad grade is future filtering. One would have to think hard to find other situations where the buyer pays for a service which filters them out of their own future. Further, what exactly is the economic value of this bad grade? What exactly does a “D” in calculus say? The student did not master the material. Yes? Was it a matter of timeframe? Was it the teacher/student combination? Was it the program management on the assignments? Finally, and most importantly, what does the student do with this grade? An "Incomplete" seems to be a much more reasonable and accurate assessment of the situation. One wonders if a simpler capability-based model would be better for all involved. Getting back to the fundamentals ... If instructors/class are indeed scarce, the current system is a perfectly reasonable response and it has indeed, existed for hundreds of years. The result is a “quantum educational model.” Because of resource/cost issues, a great deal of energy is required to move in/out of the system. Whether it is the move from high school to college, college to the work environment, or back-to-school retraining, the moves is resource-intensive. Can this situation be changed? What if the basic underpinnings of the model are significantly changed? Imagine if the real cost of access to instruction to classroom and world-class instruction were radically reduced! The impact would be profound in terms of the current educational system but also the access to education throughout a lifetime. The implications of this eminent reality will be examined in the next article.